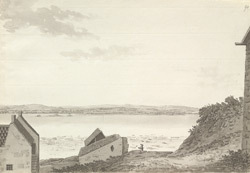 A view in ink of an island on the river Severn, taken from a window at Aust Passage, with the River Wye flowing into the Severn in the background. The crossing of the river from Aust to Beachley in the parish of Tidenham, Gloucestershire was about two miles. This was the way to the Forest of Dean, Herefordshire and Upper Monmouthshire.